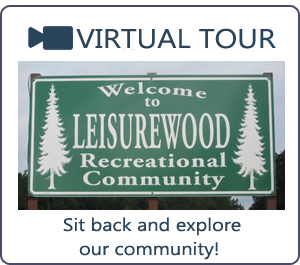 Sales & Rental - Leisurewood Campground, Inc.
WE HAVE 910 SITES WITHIN OUR COMMUNITY! The lots range from 35'x75' to about 45'x90' and as large as 45'x150'. Some lots are located in heavily wooded areas with others in partially shaded areas. TRAILERS MUST BE 1998 OR NEWER! TENT CAMPING AND POP-UPS ARE NOT PERMITTED! In addition to our rental lots we have many lots available to purchase as a 99 year lease. Stop in for more information. Rental Rates include water, sewer and electric. 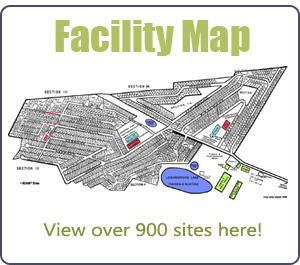 Most sites have a stone or asphalt pad, grass sites, TREED & OPEN sites are available. All sites are back in - NO pull thru sites. Each site is served with WATER and SEWER, and most sites are serviced with both 50 & 30 amp electrical service. Our 50 amp big rig sites all have aspahlt paving material and are larger making it easier for big rigs to park. Propane gas, satellite, or cable TV is available from local service companies. ©Copyright 2019 Leisurewood Campground, Inc. All rights reserved.